Hi everyone! 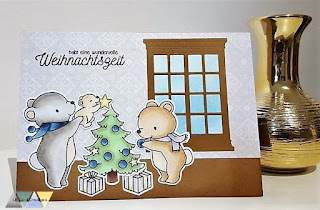 I am back with my 8th Christmas card design :) Again I used Mama Elephant stamps and dies. First I created the background scene. 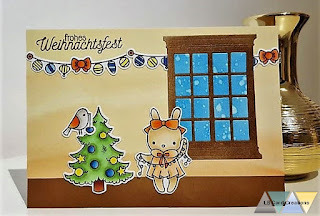 I used patterned paper for the wall and diecut the 'window watching' die from Mama Elephant out of it. I also used the same die for the frame (cardstock which I colored in with my ink blending tool and walnut stain distress ink) and the sky (cardstock which I colored in with my ink blending tool and tumbled glass/salty ocean distress ink). I blended some more walnut stain distress ink on a craft card base as my floor. Then I glued the pieces together and started with the images. 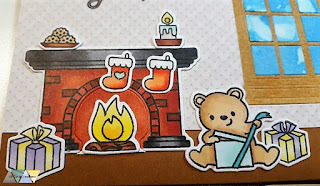 I used the three stamp sets: 'a beary Christmas', 'merry mantle' and 'pix's happy holiday'. After stamping them with Memento tuxedo black I colored them in with Copic markers. 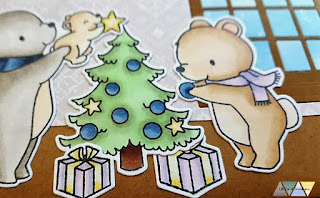 I adhered them to the scene and added some highlights with the wink of Stella brush pen. 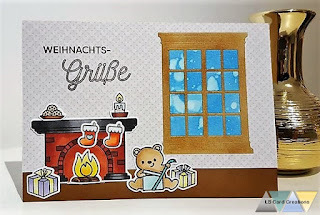 For the sentiments I used German Christmas greetings.